If you have 2 "Magician" cards in your Pendulum Zones, while this card is in your hand or Graveyard: You can Special Summon this card, but banish it when it leaves the field. You can only use this eff..
Pendulum Effect: Each turn, the first Pendulum Monster(s) you control that would be destroyed by an opponent's card effect, is not destroyed. Monster Effect: When this card is Pendulum Summoned from..
Pendulum Effect: Unless you have a "Performapal" card in your other Pendulum Zone, this card's Pendulum Scale becomes 4. During your Main Phase, if this card was activated this turn: You can add 1 Le..
Pendulum Effect: If a "Performapal" card is activated in your other Pendulum Zone: You can draw 1 card. You can only use this effect of "Performapal Guitartle" once per turn. Monster Effect: Once per..
Pendulum Effect: Once per turn: You can reveal 1 "Performapal" or "Odd-Eyes" monster in your hand, and if you do, reduce the Levels of monsters in your hand with that name by 1 for the rest of this tu..
During either player's turn, when a card or effect is activated that would inflict damage to you: You can discard this card; make that effect damage to you 0. During either player's Main Phase: You ca..
Once per turn: You can Fusion Summon 1 Fusion Monster from your Extra Deck, using monsters you control as Fusion Materials, including this card. If this card in the Pendulum Zone is destroyed: You can.. When this card is Normal Summoned: You can Special Summon 1 Level 4 or lower "Superheavy Samurai" monster from your hand, then change this card to Defense Position. Monsters your opponent controls can.. Cannot be Normal or Flip Summoned, if you have any Spell/Trap Card in your Graveyard. When you take battle damage, if you have no Spell/Trap Cards in your Graveyard and this card is in your hand: You ..
Pendulum Effect: You cannot Pendulum Summon monsters, except "Superheavy Samurai" monsters. This effect cannot be negated. Once per turn: You can target 1 "Superheavy Samurai" monster you control; inc..
Pendulum Effect: While you have a Spell/Trap Card(s) in your Graveyard, this card's Pendulum Scale becomes 4. Once per turn, when a "Superheavy Samurai" monster you control destroys an opponent's mons.. If your opponent controls a monster and you control no monsters, you can Special Summon this card (from your hand). When this card is destroyed by battle and sent to the Graveyard: You can Special Sum..
During damage calculation (in either player's turn), if a "Melodious" monster you control battles an opponent's monster: You can send this card from your hand to the Graveyard; change that opponent's .. If you control a "Blackwing" monster other than "Blackwing - Harmattan the Dust", you can Special Summon this card (from your hand). You can only Special Summon "Blackwing - Harmattan the Dust" once p..
Monsters your opponent controls cannot target face-up "Ninja" monsters for attacks, except this one. Monsters your opponent controls cannot target face-up "Ninja" monsters with card effects, except th..
Once per turn, during either player's turn: You can discard 1 "Ninja" monster, then activate 1 of these effects; :- This turn, "Ninja" monsters and "Ninjitsu Art" cards you control cannot be destroyed..
You can Tribute Summon this card by Tributing 1 "Ninja" monster. If this card is in Attack Position: You can target 2 "Ninja" monsters in your Graveyard, except "Twilight Ninja Getsuga, the Shogun"; c.. 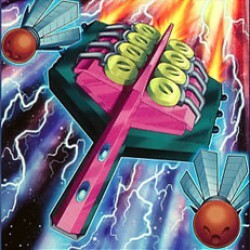 This card's name becomes "Buster Blader" while it is on the field or in the Graveyard. If a monster(s) your opponent controls is destroyed by battle or card effect and sent to the Graveyard: You can t.. When this card is Normal Summoned: You can add 1 "Destruction Sword" card from your Deck to your hand, except "Buster Whelp of the Destruction Swordsman". You can only use 1 of the following effects o..
You can target 1 "Buster Blader" you control; equip this monster from your hand or your side of the field to that target. While this card is equipped to a monster, your opponent cannot Special Summon ..
You can target 1 "Buster Blader" you control; equip this monster from your hand or your side of the field to that target. While this card is equipped to a monster, monsters in your opponent's Graveyar..
You can target 1 "Buster Blader" you control; equip this monster from your hand or your side of the field to that target. While this card is equipped to a monster, Spell/Trap Cards that are already fa..
Pendulum Effect: Once, while this card is in your Pendulum Zone: You can target 1 card in a Pendulum Zone; destroy it. Monster Effect: "Luster Pendulum, the Dracoslayer" continues his journey to uncov..
Pendulum Effect: If another "Dinomist" card(s) you control would be destroyed by battle or an opponent's card effect, you can destroy this card instead. Monster Effect: When another Pendulum Monster y..
Pendulum Effect: Once, while this card is in your Pendulum Zone, you can negate an activated card effect that targets another "Dinomist" card(s) you control, then destroy this card. Monster Effect: A..
Pendulum Effect: If another "Dinomist" card(s) you control would be destroyed by battle or an opponent's card effect, you can destroy this card instead. Monster Effect: When this card destroys an oppo..
Pendulum Effect: Once, while this card is in your Pendulum Zone, you can negate an activated card effect that targets another "Dinomist" card(s) you control, then destroy this card. Monster Effect: If..